Backpacker Workers To Start Paying Taxes? The Prime Minister, the Hon. Malcolm Turnbull, has announced that Federal Budget will be handed down on Tuesday 3 May, a week earlier than the scheduled date. The government said it would review the taxation and superannuation arrangements for the Working Holiday Maker visa program, further to the proposed 2015 Budget measure to introduce the so-called “backpacker tax”. The review will look at the proposed measure to ensure Australia “does not lose important market share in backpacker visitation” and that Australia adopts “a balanced and equitable approach” to the tax status for workers on visas, according to Senator Anne Ruston. All that is about to change from 1st July 2016, when a new tax rule will come into effect, removing the tax free threshold for these workers. The result will mean that, as non-residents, they will be subject to tax at a rate of 32.5% on every dollar they earn. 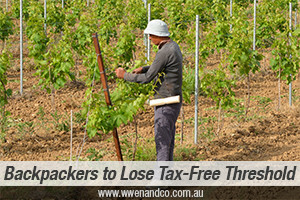 Since this change was announced in the 2015-16 federal budget in May last year, it has become known as the “backpacker tax”, named after the group of workers it is likely to affect the most. The National Farmers Federation (NFF) has expressed alarm at the new rule, as the large numbers of working holiday visa holders are an important source of seasonal labour. According to a recent Tourism Research Australia’s report, 606,000 backpackers visited the country in 2015, up 4% from the previous year. They spent $4.3 billion while here, or 13% of the total tourism spend (an average of $5,295 each, again up 4%). For questions relating to the backpacker tax, please contact out chartered accountants, serving North Rocks, Parramatta and Sydney Hills Districts from our Epping Office.